Zlatan Ibrahimovic couldn’t guide this one in but did convert two penalty shots in the win over Portland. (Photo by Duane Barker). 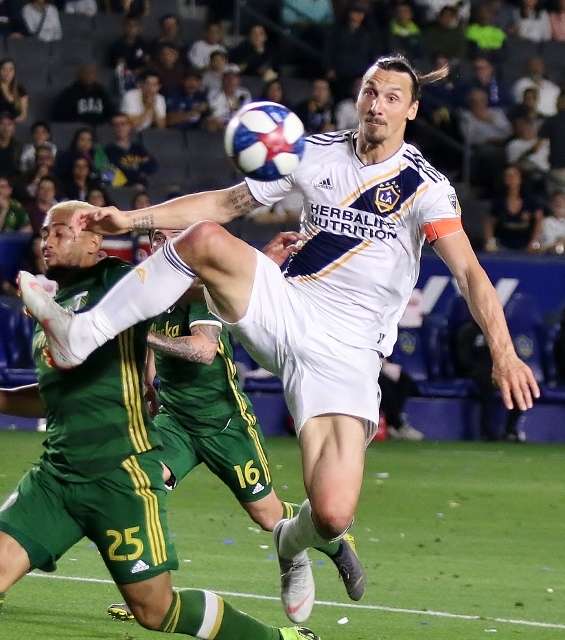 (Carson) – Zlatan Ibrahimovic scored on two penalty kicks to propel the Galaxy to a 2-1 win over Portland Sunday night before 23, 820 at Dignity Health Sports Park. Ibrahimovic, in his first game back from an injury, was fouled in the first half and in the second half and both times he converted the free kicks. 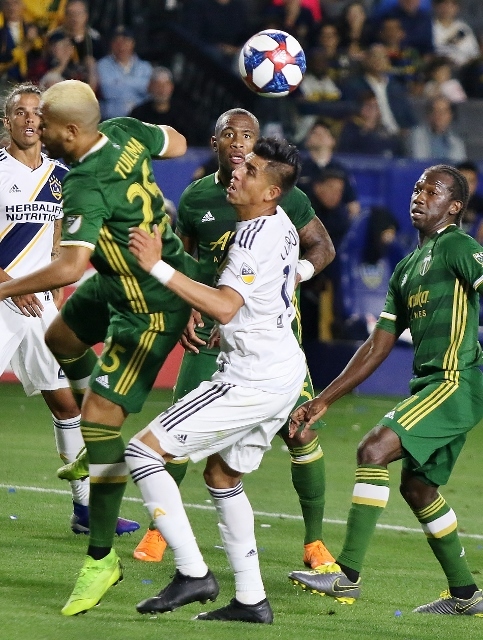 Portland scored once late in the first half but the Galaxy had enough for the win. Early in the match Portland’s Diego Valeri was denied when his shot was saved by David Bingham in the third minute. In the 14th LA nearly took the lead when Ibrahimovic’s bicycle kick hit the post just to the right of Portland goalkeeper Jeff Attinella. In the 17th minute of action Ibrahimovic had another chance but his attempt was easily corralled by Attinella. The Galaxy continued to threaten in the first half as Daniel Steres had an opportunity in the 22nd minute but his boot from distance flew high over the crossbar. In the 33rd minute Ibrahimovic broke through when he slammed it home on the free kick after being knocked down in the box. He kicked it left as Attinella was leaning right. In the 40th minute Sebastian Blanco broke past the Galaxy defense but his kick on goal sailed high over the net. Four minutes later the Timbers got even when David Guzman dished a perfect pass to a cutting Jeremy Ebobisse who jammed it into the back of the net. The teams went into the break tied. Portland had six total shots compared to four for the Galaxy at the half and both teams had three shots inside the box. Roman Alessandrini was dragged down from behind in the 54th minute and it appeared it should have been a free kick for the Galaxy but the officials let it go. Joe Corona battles for a lose ball in the win over Portland. (Photo by Duane Barker). Early in the second half a fan raced out on the field but was quickly taken down by security. Ibrahimovic received a nice cross from Rolf Feltscher but was stopped right in front as he collided with Attinella in the 60th minute. Six minutes later Ibrahimovic put the Galaxy ahead to stay on the second penalty kick. This time he chipped it right over the head of Attinella and into the net. He was leveled by Attinela as he raced through the box to earn the penalty. Ibrahimovic almost made it 3-1 in the 70th minute but his header was saved on a nice play by Attinella. Chris Pontius replaced Alessandrini in the 76th minute. Ibrahimovic missed just wide left with a minute left in regulation. Four minutes of stoppage time were added but the Timbers couldn’t convert and the Galaxy held on for the win. For the Galaxy the 2019 campaign has started well. They improved to 3-1 with the victory. Portland dropped to 0-3-1.